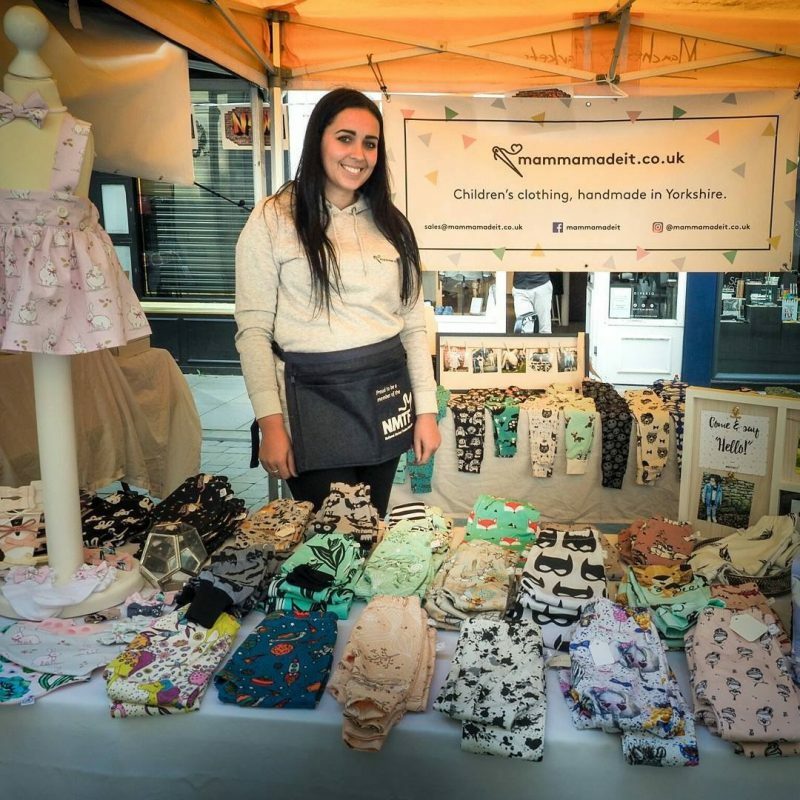 A young mum with a flair for fashion is using her creative talents to sell her unique range of bespoke children’s clothes to parents around the globe, after securing support from the help of Sheffield City Region wide business support programme, Launchpad. Fashion Design graduate Abbie Allert launched her handmade baby and toddler clothing business, Mamma Made It, in June 2017 after giving birth to her first child. Like most new mums, Abbie spent time trying to build a new wardrobe – something which proved to be difficult as her son was a long, slim baby and unable to wear high street clothing comfortably. Undeterred and out of options, the 27 year-old mother from Wombwell decided to craft her son a hand made pair of leggings for everyday use. Her designs soon caught the eye of other mums at her mother and toddler group and she started to receive her first orders. What started as a one-off project proved to be the foundation of a brand new business idea and with growing numbers of orders from local mums, Abbie decided to transform her talent into a business venture, creating an Instagram page to showcase her sewing skills. As her following increased, so did the order requests. Keen to develop her online presence further and to try and build a business around her designs, Abbie turned to the Sheffield City Region Growth Hub led Launchpad programme; a fully-funded ERDF programme developed to support entrepreneurs secure the right help and advice to help transform business ideas into a reality. Working with a dedicated business advisor, Abbie spent five months drafting and refining her business plans, as well as accessing a wide range of resources including training workshops and expert one-to-one guidance from business advisors and mentors. Feeling more confident and motivated from the support received from Launchpad, Abbie launched a website for Mamma Made It and her sales continued to grow. As a single parent, business owner and part-time property sales assistant, Abbie expertly manages her website and Instagram account to ensure orders are met, whilst balancing the day-to-day responsibilities of ordering new materials, promoting her designs, and spending time behind the sewing machine. Abbie also regularly sells her designs at Youth Markets and last year secured a spot at the National Youth Market in Manchester. In just under a year, Abbie has grown her business into a global platform – from long legged leggings to an online treasure trove of baby and children’s clothing in all shapes, sizes and designs suitable for all seasons. She has built a loyal customer following in the UK, Germany and even America. At just 27 years old, Abbie was crowned Young Entrepreneur of the Year at the 2018 Launchpad Awards and named as a finalist in the Highly Commended category at the 2017 National Youth Market in Manchester. She is hoping to grow her business further and is currently in negotiations with a wholesaler, as well as hoping to add new members of staff to her workforce in the near future. To increase awareness of her brand further, Abbie regularly collaborates with children’s chef and author Annabel Karmel MBE throughout the year through her Instagram account, which helps to see her sales double. “I never set out to start my own business, but what started off as a solution to a problem I was facing made me realise that I wasn’t alone. I decided to put my degree to good use, whilst helping other new mums out who couldn’t find suitable sized clothing for their children on the high street. “I’m currently producing between 70 and 100 pairs of leggings each week. As a result of the extra demand I’ve received after taking part in the Launchpad programme, I’ve needed to extend my house to give me more space to work and fulfil the orders which came unexpectedly flooding in. “Launched in 2016, the Launchpad programme was developed to ensure entrepreneurs and start-up business owners throughout the Sheffield City Region access business support when they need it the most, through one-to-one advice, workshops, seminars and mentoring.